Zaha Hadid's controversial plans for the 2020 Olympic Stadium in Tokyo have been scrapped. Japanese prime minister Shinzo Abe has announced that the design of the stadium will be started again from scratch due to spiralling costs, according to the Guardian. "We have decided to go back to the start on the Tokyo Olympics-Paralympics stadium plan, and start over from zero," Abe told reporters. "I have been listening to the voices of the people for about a month now, thinking about the possibility of a review." "Our teams in Japan and the UK have been working hard with the Japan Sports Council to design a new National Stadium that would be ready to host the Rugby World Cup in 2019, the Tokyo 2020 Games and meet the need for a new home for Japanese sport for the next 50 to 100 years." "It is absolutely right that the benefits and costs of the new National Stadium should be clearly and accurately communicated and understood by the public and decision-makers in Japan and we hope that this is one of the objectives of the review announced by the prime minister." The estimated cost of the London-based firm's Japan National Stadium rose to £1.3 billion last year. "The construction cost had been greatly inflated and there were criticisms from the public including the athletes on the plan," said Abe. "This made me believe that we'll not be able to host a game that everyone in this country will celebrate." "It is not the case that the recently reported cost increases are due to the design, which uses standard materials and techniques well within the capability of Japanese contractors and meets the budget set by the Japan Sports Council," said ZHA's statement. "The real challenge for the stadium has been agreeing an acceptable construction cost against the backdrop of steep annual increases in construction costs in Tokyo and a fixed deadline." The design has received heavy criticism from high-profile Japanese architects including Toyo Ito, Sou Fujimoto, Kengo Kuma and Fumihiko Maki, who launched a petition for the project to be scrapped due to its scale. Hadid hit back at the criticism in an interview with Dezeen in December, describing the architects as "hypocrites" and the situation as "embarrassing" for them. 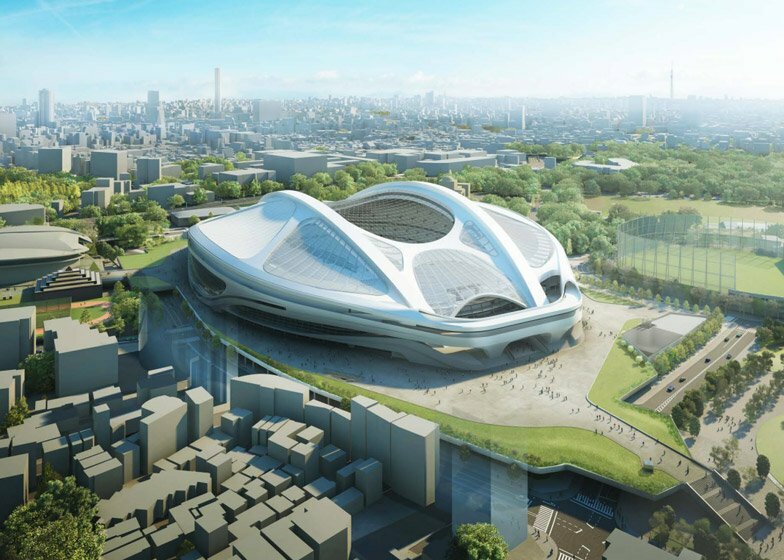 "They don't want a foreigner to build in Tokyo for a national stadium," she told Dezeen. "On the other hand, they all have work abroad." "The fact that they lost is their problem, they lost the competition," Hadid added. "If they are against the idea of doing a stadium on that site, I don't think they should have entered the competition." The design for the stadium was revised in July 2014 following budget changes and ongoing criticism – including a 500-person street protest. Arhcitect Arata Isozaki branded the redesign "a monumental mistake" that left him "in despair" after the new images were released. ZHA director Patrick Schumacher responded to today's news on his Facebook page. "Maki and Ito will be remembered for this," he wrote. The firm was announced as the winner of the competition to design the 80,000-seat Japan National Stadium in 2008, before Tokyo was named as the host city for the 2020 Olympic and Paralympic games. Abe said that the 2019 Rugby World Cup matches also scheduled to be held at the venue, including the opening match and the final, will no longer take place there. ZHA designed the Aquatics Centre for London's Olympic Games in 2012, and is also creating a stadium for the 2022 football world cup in Qatar. "We have used our experience on major sports and cultural projects, including the hugely successful London 2012 Games and legacy, to design a stadium that can be built cost-effectively and still deliver the flexible and robust National Stadium that the Japan Sports Council requires," said the firm's statement.